LAB 1: COMBINATIONAL SYSTEM DESIGN USING BASIC GATES AND EQUATIONS. VHDL Lab Exercise 1 :: VHDL with Naresh Singh Dobal Learning Series. Task1 : Write a VHDL Program for all Logic Gates. Task2 : Write a VHDL code for a Half Adder using Digital Electronics. Task3 : Write a VHDL code for a Full Adder using Digital Electronics. Task4 : Write a VHDL code for a Half Subtractor using Digital Electronics. Task5 : Write a VHDL code for a Full Subtractor using Digital Electronics. Task6: Write a VHDL code for a 4:1 Multiplexer using Digital Electronics. Task7: Write a VHDL code for a 1:4 Multiplexer using Digital Electronics. Task8: Write a VHDL code for a 4:2 Encoder using Digital Electronics. Task9: Write a VHDL code for a 2:4 Decoder using Digital Electronics. 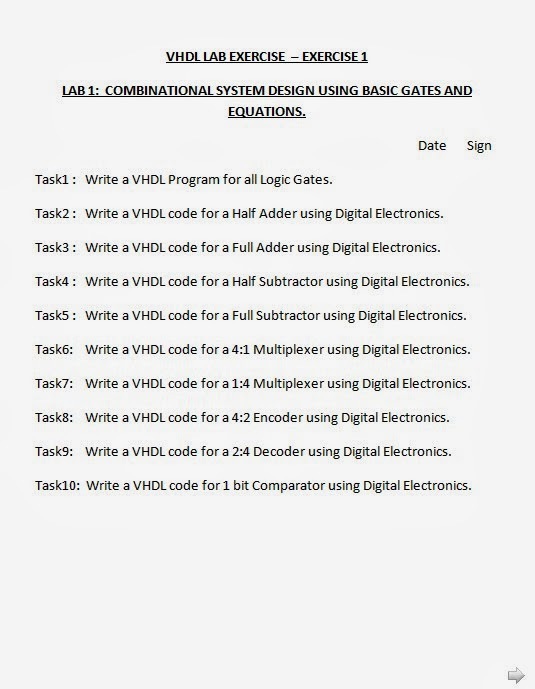 Task10: Write a VHDL code for 1 bit Comparator using Digital Electronics. Solutions of assignment paper 1.